"Mathis Retreat : 21 rooms and bungalows , encased in a lush tropical vegetation, all decorated and designed for your comfort, blending modern facilities and Balinese tradition for the pleasure.Large rooms and lounges have been created for your relaxation, all equipped with air conditioning, with an area of between 40 and 50 m2, king or queen size bed (twins on request), sofa with terrace or garden rooms Private for bungalows, full bathroom with tub and shower. Possibility to book two connecting Retreat Rooms (adjoining rooms) for up to 5 people. A western professional team and a householder are at your listening from your arrival to departure, available to meet all your needs. 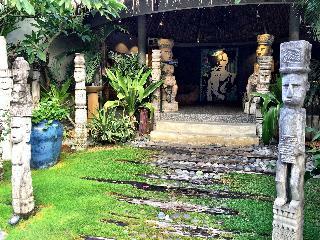 This comfortable resort can be found in Ubud. 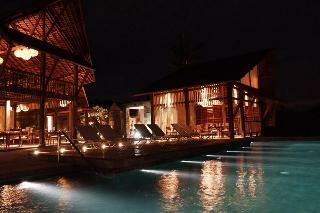 The resort comprises a total of 26 snug units. 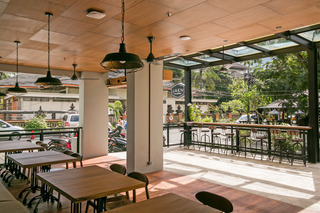 The year of construction of this establishment dates back to 2018. Tejaprana Bisma is located in a hidden corner in the heart of Ubud in the highlands of center Bali, yet just a shortcut away from its fabulous boutique and the fabled Monkey Forest.Nestled between the Campuhan river valley and sprawling paddy fields, it is the perfect place to unwind at the end of the day and be inspired as nature paints the horizon with the glorious colors of sunset.Tejaprana Bisma is another masterpiece by the awards winning firm Arte Architect & Associates, renown for creating serene spaces immersed in Balinese Taksu. 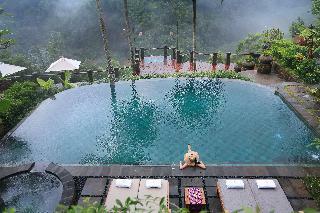 Located in Nusa Dua, Bellevue Heritage offers an outdoor pool. This self-catering accommodation features free WiFi. The property is 3.6 km from Geger Beach and 3.7 km from Bali International Convention Centre.The air-conditioned villas feature a seating area, private bathroom, satellite TV and a fully equipped kitchen. Pool views can be enjoyed from here, and a daily breakfast is included.At Bellevue Heritage guests will find a garden and a terrace. Other facilities like luggage storage are offered. The property offers free parking.If you feel like visiting the surroundings, check out Pasifika Museum (3.9 km) and Bali Collection (4.1 km). 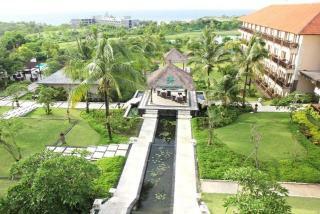 Bali Denpasar International Airport is located 8 km from the property. 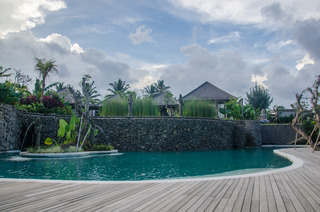 Inspired by genuine Balinese culture, The hotel is the perfect tropical getaway. Nestled on a gentle hill within a stone's throw of one of Bali's most famous and gorgeous beaches.Step into open-air lobby, guests are welcomed by the breathtaking vistas of the Indian Ocean and a virtual carpet of verdant green and gently swaying palms. Spend the days relaxing by crystal clear pool, have a massage in Spa, or just walk along Dreamland Beach. For the more adventurous, there are a multitude of tours to all of Bali's top destinations.When the sun goes down, the fun at the hotel carries over to KLAPA, Bali's newest go-to entertainment complex - a hit amongst Bali's socialites and beautiful people. KLAPA is located just 5 minutes away and directly on New Kuta Beach, where guests can enjoy a breathtaking sunset over the Indian Ocean before experiencing a full night of excitement.New Kuta Hotel offers well designed conference and banquet facilities that are suitable for hosting various corporate meeting and social gatherings.Come and experience our Pecatu Grand Ballroom that can accommodate up to 600 persons with excellent catering and facilities. We'll take care of all your weddings, concerts, conferences and exhibitions needs.You will find well appointed rooms, guest-focused services, a variety of tasty dining options at an affordable price, and our spa, fitness center and swimming pool will keep you active and pampered throughout your stay. Zest Hotel Legian is an outstanding budget hotel featuring 51 stylish, modern and comfortable rooms, a roof top pool and an international restaurant and bar. 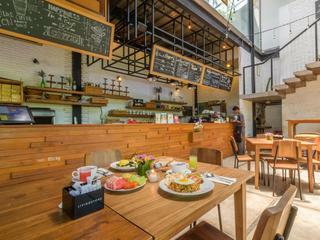 The building is located in the Seminyak area in Bali, close to restaurants, the beach and many shops. Ngurah Rai International Airport is a 20 minute drive from the hotel. It is only 5 minutes to Petitenget Beach by car. The Kuta Beach is reachable within just 15 minutes drive from the property. The boutique hotel offers a unique experience with luxurious and spacious suites in fashionable Seminyak, one of Bali's most sought-after areas. The hotel offers its guests massages in the spa. Guests can also work out in the gym or have a refreshing swim in the outdoor swimming pool. There is also a kids' club for children. The nearby beach is sandy. A restaurant with room service is available for breakfast, lunch and dinner. For a truly wonderful stay in an idyllic setting, stay at this boutique hotel. Seminyak attracts the many for its distinguished food scene, vivacious nightlife and unrivalled beach vibes; but Blue Karma guests travel from far and wide to discover a secret side to Seminyak, one that offers a tranquil and serene escape from the noise, a place to unwind and retreat from the hub of activity just outside.Weathered recycled timber, antiques from Sumba and other islands of Indonesia have been used to create unique interiors rich in character.Blue Karma is a refreshing mix of an intimacy and Balinese culture. Featuring private villa suites and lush public areas for social interaction. Each suite is a unique sanctuary that blends ethnic craft and modern amenities to create comfortable living.